I don't quite get why folks in Bellevue are so set on keeping transit out of the center of the employment district. For some reason many of them irrationally believe that the line will end life as we know it, yet in all respects the line will improve the center's economic standing by providing more access to the jobs for the regional workforce. The solution of one Bellevue council member is to place a station along the freeway and provide a long walkway to the center of the district. Others argue that Denver has a bus connection, so why should it be that big a deal that the employment center is connected to the train station by a bus? For one thing, Denver's bus mall is dedicated to transit alone and has buses coming so often that you can always see the next one approaching. I seriously doubt that a place which has fought against light rail so hard would put dedicated bus lanes downtown and run such a service. But really what is the point of rapid transit if it doesn't go into the center of activity? The more apt comparison is Bellview station in Denver (funny how the names are the same) right next to the tech center, which we have discussed in previous posts. That should be used as an example of what to avoid when locating a station near a major employment center. Apparently there is a lot of research that discusses the issue as well. 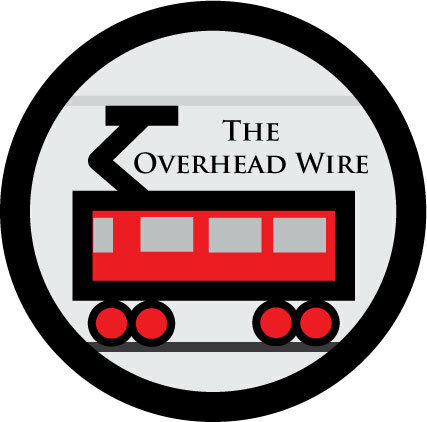 Robert Cervero has looked at this issue in a paper called Office Development, Rail Transit, and Commuting Choices. Ultimately the findings show that the further the station is away from office buildings are, the less likely workers are going to use transit. 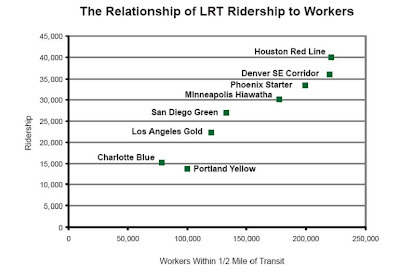 If the station is near the office, workers are three times more likely to take transit to work. Also employment density matters as well. The greater the employment density, the more people will take transit. In the Bay Area, the Cervero paper cites statistics that for every 100 workers per acre more, 2.2 increase in commuting by transit. In the Twin Cities, Professor Gary Barnes of the University of Minnesota found that the central city and CBD were greater attractors of transit ridership than suburban offices. So for every increase in 1000 people per square mile in residential density, CBD ridership increased by 2.43%, central city destinations increased by 1.15% and suburban job locations increased by .63%. Ultimately where you are going matters just as much if not more than where you are coming from. 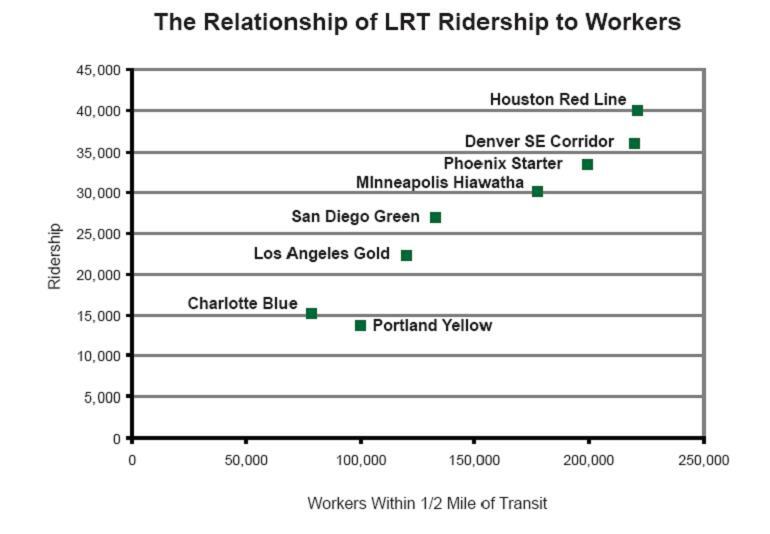 For light rail lines, transit ridership increases the more jobs are within a half mile of the station. Using LEHD data, if you look at recently constructed light rail lines and employment within a half mile of the station, the number of jobs is related to the number of riders that a line gets. Here are a number of recently constructed lines charted against workers. So with all this evidence why would anyone ever think about running a line outside of an employment district instead of right through it to capture more riders? The goal should be to boost and improve accessibility for workers, who make up 60% of transit ridership, not make it harder for them to use transit. It's a no-brainer. Build a line where the population is. The PDF actually indicates that the traditional 1/4 mile circle is far more applicable than the new 1/2 mile circle being used (partly in an attempt to make commuter rail look less awful in many cities, methinks). There's a huge fall-off in modeshare as you approach 1000 feet, which is just shy of 1/4 mile. At 1/2 mile, the curve is essentially flat - makes no difference going from 1/4 to 1/2 and beyond, which stands to reason (those few willing to do that are either walkers-by-choice or transit-dependent-that-don't-mind-shuttle-buses). It doesn't seem to make much sense to go "away" from the heart of the employment district. Here in PHX, we have seen a great response to areas where light rail is "convenient" for people to use. The 1/4 mile radius looks to be the sweet spot here, as well. Some places 1/2 mile away are ok for "recreational" users ( we have a LOT of them) but, for workers, the stations need to be close and convenient. The argument of Barnes paper is really striking: "This paper argues that policy makers hoping to reduce congestion through increased transit use should focus on increasing the size of downtowns, and on developing downtown-like centers in suburban locations." I don't think there is enough focus on growing downtown employment, which seems to be the best focus. Minneapolis has room to esstentially double its office space downtown, considering the entire east side is surface parking, yet that concept has not been linked to increased transit ridership. However, that's probably the best way to increase transit mode share in the Twin Cities region. I agree Faith, there is a lot of space in Minneapolis to grow. And with the possibility of two lines going through that section of downtown very soon I don't see why its not on everyone's radar. Putting residences and attractions (food, drink, games) in downtown is also beneficial. A stark difference between the vibrant cities of the world and the dead ones is the amount of residential space in use in downtown. Melbourne, Victoria cbd was fairly dead in the 80s, then there was a big push to put residences back into the cbd, and modulo some unfortunate alcohol and drugs fueled violence, nobody has looked back. San Jose, CA, is also picking up now with more and more people living downtown.